Have you ever wished that you could time travel? Like in the old Star Trek when they had those automatic transporters? Imagine if you could just snap your fingers and a few seconds later you could find yourself in any place in the world you desired to be. How cool that would be. So I haven’t quite figured out how to time travel yet, but I’ll let you know the secret when I do. In the meantime I did find a way to escape to another country and culture right here from my home base. As I’ve mentioned, I like to find a sense of “adventure” in every-day life, which is not a hard thing to do in my hometown of Washington, DC. 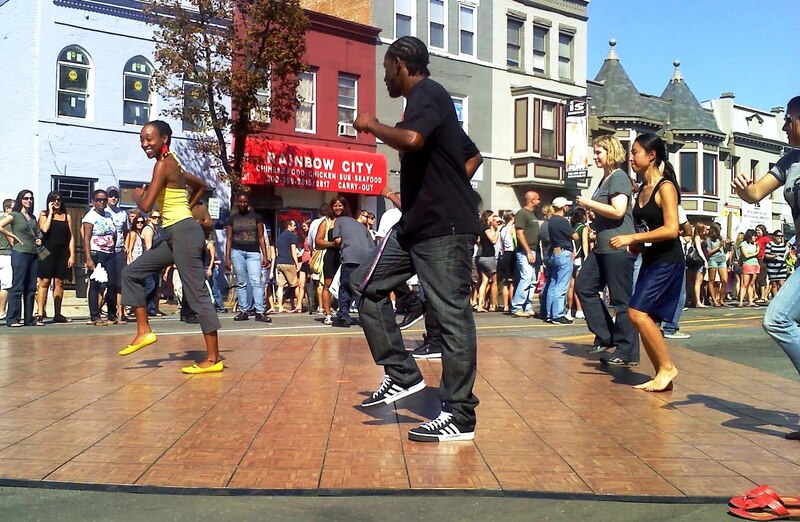 Tis the season of street festivals in this eclectic urban metropolis. Every weekend for the past month has been characterized by a different street, with different smells, tastes, and sounds. It is one of the amazing things about this great city I call home and I love it. Last week was the 8th Street Festival AND Turkish Festival. I opted for Turkish Festival, and glad I did, it rocked. Doner kebab, baklava, folkloric dancing, Turkish rock, art, history, and all the rest. The week before that was the H Street Festival, which was a mere 1 block from house, and let me tell you how fun that was. It’s the epicenter for all things DC-hipster, literally! There were crazy artists painting & building their masterpieces. Rythym fusions from all around the world. Local designers sharing their wears on the runway. And the food… well I don’t know where to begin… suckling pork pops, curry mussels, Maine lobster rolls, grilled oysters, BBQ ribs – name your favorite street food and bam there it was. And then there was the food… the best part of all. Food stations were set-up all throughout the street. 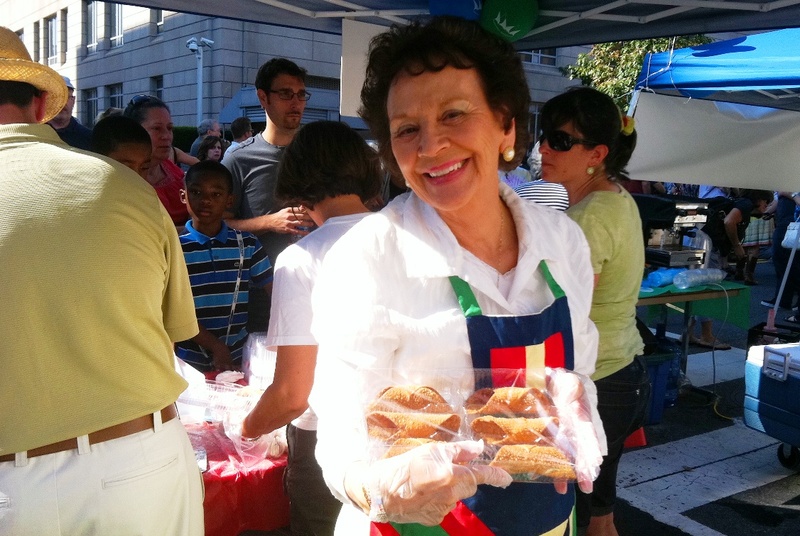 Pizza, Pasta, Italian Sausage & Peppers, Gelato, Porcetta Sandwiches, Cannoli, Espresso…. every Italian delight your heart can possibly imagine. After eyeing all of the food stations we opted to give the homemade cannoli a try and I am glad that I did. Mama Vaccaros was out there squeezing the cannoli cream into the crispy baked shells. And at 2 bucks each, who could resist giving the sweet indulgence a try? Meanwhile my husband went over to the “adult beverage” tent to try some authentic Italian wine, also just 2 bucks a glass, to wash down all the delicious eats with. 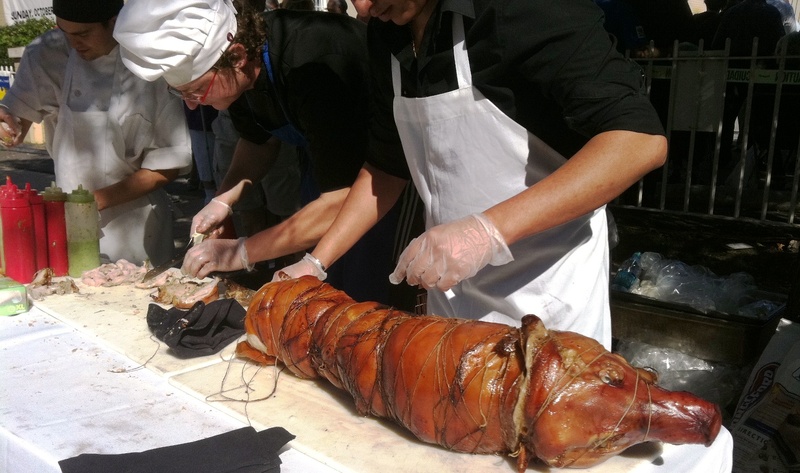 Then we went back to the Porcetta station to find that the whole suckling pig was ready to be taken off the spit and made into sandwiches. Yes indeed, a whole suckling pig on the spit ready to be sliced-up for Porcetta sandwiches. Create a vision in your mind for this one… a freshly baked Ciabatta roll is sliced open. Then it is given a generous shmear of salsa verde (an intoxicating concoction of fresh parsley, basil, garlic, salt, and olive oil). And last but not least, it is stuffed with a heap of sliced juicy pork. The flavors marry to perfection… it’s a sandwich fit for a king (or queen). And how divine it was! Enjoying the taste of Italy alongside “everything Italian” in Washington, DC really was like “traveling” to Italy for a few hours. I may not have figured out the magic behind the automatic transporters but these little adventures in the streets of DC come pretty close! Till next Time. Ciao! The past week has been a whirlwind. The seasons collide and Fall is upon us. At this very moment the stars align and bring forward an opportunity for change in my own life. Sometimes I don’t know exactly what the catalyst is, perhaps its all of the energies coming into one at a particular moment and it ignites a signal that now is the time for change. Change is an opportunity. But its also incredibly frightening. You can feel like your whole life has been turned upside down. Or better yet, that you just made a decision that brought forward a change and deliberately turned your own life upside down. In a nut shell that was what this week was for me. The change occurring in my life is on the professional side of life, which for me is wrapped-up in my personal emotions and purpose in life. My “career” is one that I’ve created… its synonymous with my last blog post. In building my career and business, I’ve built my own life in the process. It is all so deeply intertwined. I’ve spent the last 7 years of my life building and nurturing a business and a couple of organizations. I’ve poured my sweat, love, and tears into building these institutions. It has been incredibly challenging, exhilarating, gratifying, and disheartening all at the same time. There have been many moments along the road where I’ve stopped and looked within and found that my own personal well was empty. That I’d given so much in the process that there was nothing left to me. I’ve lost balance many times along the way, and forced myself to take the time to replenish my well, regain strength, and carry on. Each of these organizations, with all their beauties & flaws, are a reflection of many things I am passionate about in life. They are in and of themselves catalysts of social change in varying forms. There have been so many “signs” that this has been coming, but I really had no idea when I would get up the courage to make it happen. In December of last year, I travelled home to Costa Rica for a weekend. It was the Reunion for my graduate school, the United Nations-mandated University for Peace. Despite being incredibly busy with work, I knew I needed to make the trip. Here I met a lovely colleague, we connected and talked for quite a while. She shared with me that I am in the midst of my “Saturn Return” and that it was a time of major change in my life and that it was going to be difficult but that it would work out for the better. Facinating… First of all, I really had no idea what “Saturn Return” even meant until I got back home and researched it on the web. I had put this moment out of sight out of mind until last week, when it came charging into my life. I just knew, my gut instinct, that this is the moment to make the change. For over a year, I’ve been feeling a lack of professional growth. Sure, I continue to learn new things everyday. I talk to our management team about it and we tried to make changes & concessions several times over. But I’ve continued to feel incredibly stuck in a position that forces me to fill roles and responsibilities that don’t draw on my strengths. Yes, I CAN do all these things, I’ve learned to do them out of necessity. I’ve tried (for years) to grow to like to do these things, but I’ve also grown into my own potential and with each passing day finding myself less and less happy in these roles.. I just don’t have time to fill these unsatisfying roles and also capitalize on my strengths by doing the things that derive my energy & passion. I’m constantly battling against time. Do I take 10 hours to work on legal filings? Or, Do I spend those 10 hours charting a vision & implementation strategy for a new program? Both are equally important at all levels. But only one of those things draws on my strengths. Unfortunately, there is only time for one or the other… and well I am never going to get those 10 hours back. This is the same time conundrum I wrote about a couple of months ago. It had turned into an intractable conflict in my life. Yes, there are good days. And I have learned more in the past 7 years than I would have ever learned in a “standard job” over 20 years. I am grateful for all I have learned in the process. But the bottom line is that it had become toxic to me and the only way to make it healthy was to make a change. It was the moment I realized that this is just not working for me. So the decision was mine and I made it. I made the decision to exit. And I had no idea what it meant for me. Its not like I had my dream job waiting for me when I made the decision. I hadn’t even thought about looking for jobs, I haven’t even updated my resume in over 7 years! The stars aligned and BAM I made a pretty big decision. I found myself empty again, but in a different way (you know as they say in Asia, “same same but different”). Empty as in Taoist empty. Sure I felt scared and vulnerable. I felt incredibly fearful and anxious at first. But the emptiness that came with the decision to make this change has become very liberating. I felt empty – open to all the new possibilities the world has to offer. Free – from the burden of the daunting challenges I faced every day. Then a good friend who lives all the way in Singapore sent an email that she herself had received from a professional mentor… it was like a 2 page interactive manifesto on the ‘Journey to Self’… it was called “Stop the World I Want to Get Off”. Ah timing can be incredible! If telepathy exists, I swear that it was happening at this very moment. This short manifesto on life reflected the essence of the challenges I need to face & deal with at this very moment in my life. This change in my professional life is reflective of the first step I need to take in overcoming these obstacles to living the real life that is meant for me. That is me… I am the person staring back from the words encapsulated on these 2 pages. I am not ready to go into all of the things that this manifesto on self is about or how it reflects me and how I got to where I am… I’ll save that for a blog post 20 years from now. Bottom line, I am an “over-functioner” to the point that it can become self-destructive. What I know now is that this change I’ve brought about in my life is an opportunity to grow and improve my own life. To take one step forward in becoming less of an “over-functioner” for others and become more of a functioner for myself – to live the balanced & positive life I deserve to live. For me, being “selfish” and making decision based on what is best for me is counter to my nature. My instinct is to make decisions based on what is best for everyone else. So simply making the decision that I did was the first step forward. I don’t think my selfless nature will go away, only now it will be balanced with factoring in my own needs. So there you have it. Four days ago I made a big decision and I had no idea what it really “meant”. And well, day 4 of its aftermath has brought me to some important self realizations that I otherwise would not have been able to put into perspective and begin growing from. I still don’t know what the future has in store for me. Or where I will be 4 months from now. But I am okay with that for now. I want this transition to go smoothly – and for once in my life – gracefully. I don’t fully know what this change and transition will be, but I know it is the RIGHT thing for me. With that, I conclude this day by making a few promises.